Finding the right shoes that are comfortable, supportive and look good can be a problem at the best of times. Add to that the need to find the best walking shoes for flat feet or shoes for painful heels and the number of options available to you become very limited, very fast! Having flat feet, or fallen arches as it is also known, is very a common foot complaint. It has been reported that 6% of the US population can suffer from this problem – that’s getting on for near 2 million of us who will need to buy special shoes for our flat feet. Many of us like walking or hiking or just having some good boots that we can throw on to get out of town and into the countryside or have a pair that will be able to withstand a longer walk to the shops. The best shoes for flat feet will help keep your foot supported in the right place, but also give you excellent traction and perhaps be weather-proof too? Salomon are a widely recognised brand of walking boots and outdoor gear and the X Ultra Mid GTX model, available for men and women is a great shoe for people who need extra arch support. This shoe is made from lightweight and weather resistant Gore-Tex and leather, which will make them light but also strong and durable. The rubber sole features the desired “EVA midsole” design, which will help keep your foot stable and helps reduce any stresses and strains when walking. 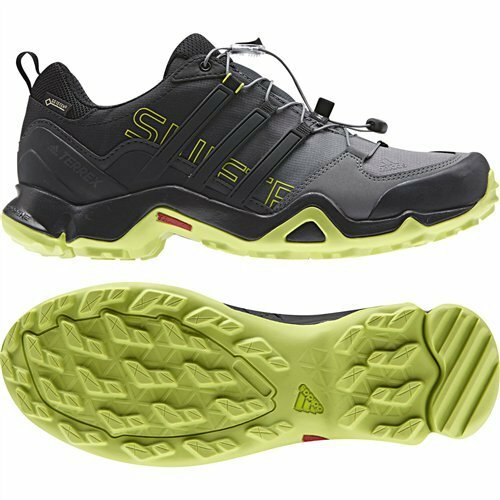 Inside the shoe, they have used a material called “Ortholite“, which gives good arch support for the flat-footed walker, making these Salomon shoes an excellent choice. What do people think of these Ultra Mid 2 GTX shoes? The reviews from people using these walking shoes are excellent, with many people praising the additional arch support and larger “toe box” area. They are also pleased with the styling of the shoes and that they are lightweight – perfect for walking the dog, or tackling that mountain. However, some people have claimed that these shoes might make your feet a little hot-and-sweaty, or that the GTX lining that is designed to keep your feet dry can let in some moisture. However, these sorts of problems are mentioned in a very small sample of reviews, so could be due to faulty stitching or wearing the wrong kind of socks! Again, Adidas are a well-known brand related to sneakers and sports shoes, but perhaps not for walking shoes – so let’s see how their Terrex Swift boots hold up to our review. Wow! You won’t be spoilt for choice when looking for some funky color walking shoes with this brand. On Amazon, there are over 40 different combinations to choose from, featuring day-glo greens, right through to plain-looking blacks and browns – and almost every color in-between! I think this is a major selling point for the Terrex Swift walking shoes. As I suffer from Plantar Fasciits, I need to wear a good pair of shoes when I am working in the office and the fact that these are available in plain black is perfect! Again, we are looking for shoes with the (magical) “EVA Midsole” and these fit the bill too, having a rugged and “grippy” sole that also offers the best cushioning and support for people with flat feet and fallen arches. Don’t buy any walking boots without the EVA sole feature – your feet will thank you for it! Adiprene insert for arch support. Similar to the previous review of the Salomon shoes, these Adidas ones also have a special removable insert that gives better arch support. These inserts are made from a special breathable material called Adiprene, so your feet won’t get too hot or sweaty. 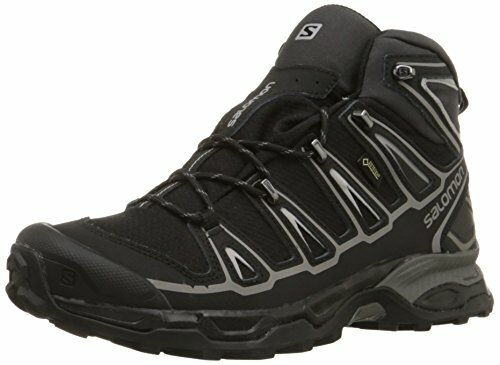 A customer from Amazon called them the “best shoe they have ever owned!” and others are saying how adaptable they are and can be used at the gym and when out hiking. One common thing people are praising the Adidas Terrex shoes for is that they are so comfortable and can be worn every day – no matter what you are doing. to read what everyone is saying about these shoes. As with most things, there are a few niggles that people have mentioned. The Swift shoes do come up as a narrow fit – so make sure you order the correct size. Because they are narrower, they might also not work well for people with wide feet or large toes – so also bear that in mind too. 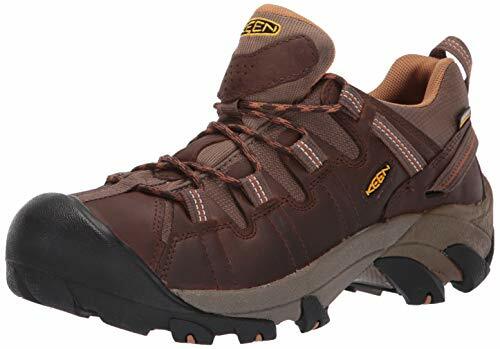 KEEN was not a brand name we were too familiar with when looking for the best selling walking shoes for people with flat feet – although, there are many 5 star reviews (over 70% with 5 star reviews as I write this) for these Targhee 2 boots and many satisfied buyers too. The Targhee 2 walking boots are available for men and women but are quite dull with their color choices, compared to some of the others we have reviewed here. The mens only come in 6 different styles, which are all drab shades of brown – although, for a walking boot – this style is perfect as it won’t show up too much dirt. These shoes offer some additional torsion stability via the “ESS Shank” which helps keep the shoe straight and helps with stability, which is perfect for walkers who need to help prevent their feet or ankles turning in when walking (known as pronation). Again, the EVA mid-sole is there too, which makes these a good and study shoe. Good arch support built in. Many customers who have already bought and tested the KEEN Targhee II walking boots have commented how comfy and supportive they are, especially around the heel and arch. They have also commented that the wider toe-box is a benefit too which helps your foot stay snug, but not too compact. Someone has even gone as far as saying that “they are the most comfortable shoes they have ever worn!” High praise indeed. As with all of the shoes we have reviewed here, the Targhee boots are waterproof and are made from lightweight rubber, leather and textiles which are backed by their KEEN.DRY breathable membrane, keeping your socks and feet as dry as a bone. Some people have mentioned that they can feel slight moisture around their feet, but this might be more related to the temperature rather than a lack of waterproofing. What do buyers report about these shoes? Overall, the reviews are positive, however there have been some (older) complaints about the production of the men’s boots. People have reported that the sole has started to come away or that parts of the grip have broken off, although these report are from over 5 years ago, so they are most likely related to a manufacturing issue. Certainly none of the more recent reviews have mentioned this problem. As a quick summary, let’s look at the main symptoms and causes of flat feet, before we look at some good walking shoes that you can buy. Pain in the arches of the feet, around the heel and ankle. Sufferers have problems standing up on their tip-toes. You get very painful and sore feet when standing for long periods of time. People with flat feet get lower back pain or posture problems. If you make a footprint, you can see more of the entire foot rather than the edge of the sole. What are the causes of flat feet or fallen arches? It can be caused by a historic foot or ankle injury that was not treated properly. Over-exercising can cause the arch of your foot to become injured. Standing for long periods of time or working on-your-feet can contribute. Wearing bad shoes (yes ladies… I am looking at your high-heels!). Other health problems such as your weight, age and specific problems such as Arthritis can cause foot abnormalities. Find out more about why we get flat feet. Here are some quick “general” solutions to help people with flat feet. Wear some orthotics in your shoes to help support your arch. Try to rest if your feet are hurting – use the “Rest Ice Compression Elevation” (RICE) method of treatment. Use your most comfortable shoes more regularly. Time to ditch those tight-fitting shoes for your sneakers! Medication such as Ibuprofen can help reduce any inflammation (only use if recommended by your doctor). Try some easy stretches to help reduce the tightness in your calf muscles and along your plantar fascia tendon. Ok – let’s get back to looking at the best walking shoes for flat feet sufferers. That’s what you came here for, so on to our suggested products. What to look for when choosing a walking shoe. Firm sole – this is something that is definitely needed with a walking shoe. Having a hard and inflexible heel and mid-sole will ensure that you will be able to use the shoe in many different environments. The front part of the shoe, known as the “toe box”, should still be flexible and allow the toes to bend as you walk. A key phrase to look for is a stiff or hard “EVA midsole” – any shoe with this feature is a good buy. The heel area of the shoe needs to be very supportive to prevent the ankle from twisting or bending when walking. If you are hiking on uneven ground, your ankle will be under greater pressure, so having the additional support is crucial. Weatherproof materials such as Goretex are great additions to any walking shoe. Also try to ensure that the soles are made from a good quality rubber to help with the grip. In addition to these general points, people who suffer from flat feet also need to think about the support inside the shoe, specifically around the arch area. Look for shoes with arch support! Most walking shoes will come with some arch support already, but many brands tend to only provide a slightly better level of support than would be considered “normal”, hoping that those of us with painful feet will use their own orthotics or shoe inserts too. However, if you try a new pair of shoes on with extra arch support built in, you will feel it immediately. In fact, it might feel like there is too much arch support to be begin with – but like with most shoes, you will need time to get used to them and to break them in.